This just may be my last post using Farmhouse Christmas. I just couldn’t put it down this year! 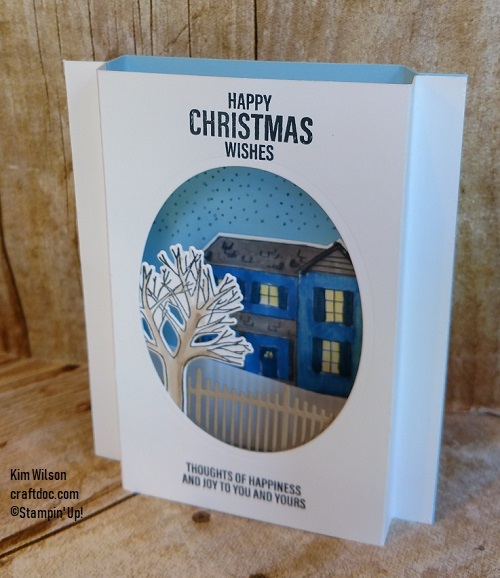 I made this fun diorama card with a snowy scene. I have seen these cards done with different measurements. I chose mine to fit folded in a medium envelope. 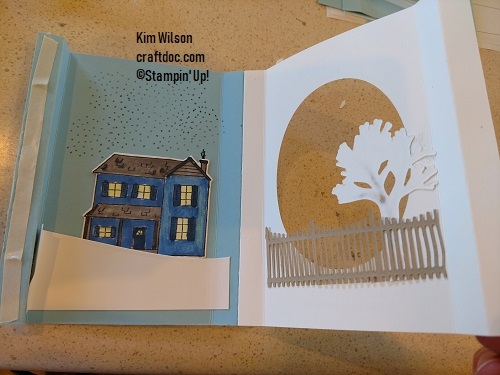 Cut Whisper White and Balmy Blue cardstock 5-1/2 x 5 – 1/2, score at 1/2 and 1″ from each side. Add some of the die cut pieces behind the front panel and some to the back as pictured. The white scrap is for snow behind the fence. Adhere the ends with Tear & Tape. Pretty easy! Try your own diorama card with a fun scene. Don’t forget – the Farmhouse Christmas bundle is retiring soon!